Time. This one word holds multiple definitions, depending on the person and the circumstance. Time management, similarly, makes some of us giddy, while others view it as constraining; unnecessary rigidity & quite frankly, a waste of time! Which camp are you comfortable claiming as your own? Funny isn’t it, that we all have 24 hours in a day. We all have 7 days in a week and 365 days in a year. Yet. Some of us, see lack of time as one of our biggest obstacles to life success. We allow this mindset, or our comfortable habits to orchestrate our daily, weekly and yearly outcomes – or lack of outcomes. Are you okay with this? Is this really how you want to continue living? Do you ever find yourself wondering why your neighbor seems to get so much done, despite working full-time and having 4 children – and a dog! Does it seem unfair that your co-worker who knows far less than you, and has less experience, was recently promoted because she continues to exceed company goals? Or, what about that colleague who leaves everyday at 5 pm, (with a clean desk and a to-do list ready for the next day), and even has time to coach soccer for the middle-school kids – AND is the primary support for an elderly parent – do you wonder how this is possible? How do they get all this done? Chances are, their super human powers are no greater than yours! Isn’t that a relief? More likely, they were taught or observed tactics and strategies and then emulated them – and practiced to refine. Surely, they took control of how they wanted their day to look. They identified what their priorities were – and put them first. See. No magic wand. Truly! There is SO much ‘community speak’ these days about mindfulness – and the power of mindful thinking. Another term you may have heard is ‘Intentional Living’ – what do these even mean? Could these two concepts have any link to managing our day to have the outcomes we plan for? Yes. I certainly think so! Intentional Living: Dictionary.com defines Intentional as doing something on purpose – done with intent. Wikipedia defines Intentional Living as a lifestyle aligned with living according to values and beliefs. (Wikipedia.com) When we apply this term to the concept of time management, we are committing our time to an achievement(s) or outcome(s) that we value. We are identifying what it most important to us, and then establishing a plan for achievement. We are declaring that we are important, and that our time is valuable. Mindfulness: The quality or state of being conscious or aware of something. A mental state achieved by focusing one’s awareness on the present moment.” (Dictionary.com) Imagine the energy & accomplishments when we are able to truly focus! *We are a participant in the Amazon Services LLC Associates Program, an affiliate advertising program designed to provide a means for us to earn fees by linking to Amazon.com and affiliated sites. You may read my full affiliate disclosure here. David Rock, shares the neuroscience behind mindfulness, and explains that it is something that can be learned, is not difficult, but does need to be practiced. He stated that, mindfulness supports better decision making, achievement of goals directed by ourselves, rather than by someone else. You can read more about the impact that motivation plays in goal setting – which certainly is connected to time management. Read that here: Motivation. Similarly, in his book, Your Brain at Work: Strategies for Overcoming Distraction, Regaining Focus, and Working Smarter All Day Long, the author, David Rock, discusses more thoroughly the concepts from his article in Psychology Today. The title speaks directly to you and I, doesn’t it? Ultimately, this is what we are seeking! We want less distraction, focused attention, productivity and engagement that ensures our goals are achieved within the time frames we set. Time management influences most aspects of life, professionally and personally. 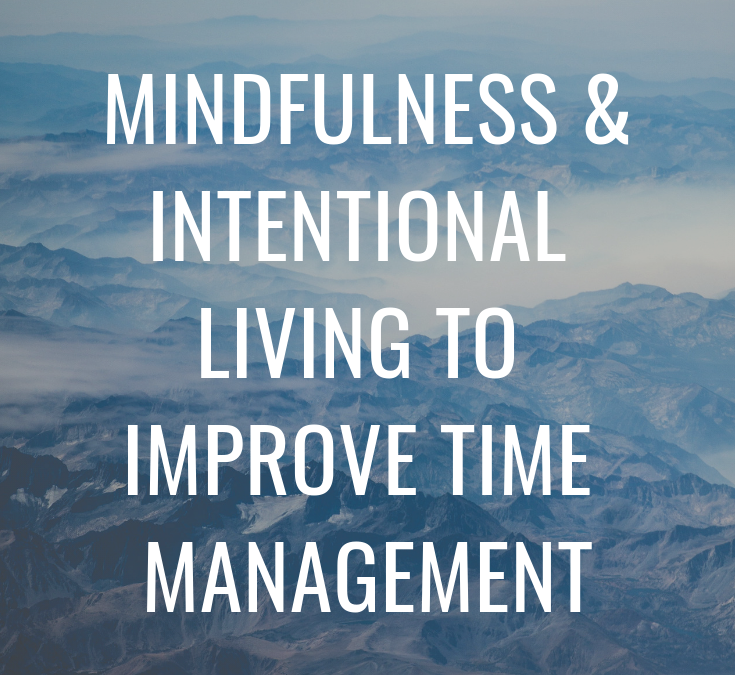 Therefore, can we agree that focusing on practicing mindful thinking that aligns with our values and priorities – ie, intentional living, is a strong step toward taking control of our time management? Using resources, at least initially, to get into the habit of mindful thinking may be helpful, especially as a newbie. This book may help you launch your quest for mindful thinking & help you to refine your goals for increased productivity through better time management. This ceramic mug may offer a visual reminder throughout your day, as well as serve a practical purpose. Besides, I think it is pretty! Additionally, it includes a raised swirl icon, intended to provide a tactile and a visual focus to center your thoughts. A multi-faceted approach toward learning and adapting new habits can reinforce our efforts. And again, it is pretty – and makes me smile! Imagine this generous mug filled with some chamomile tea for relaxing, or some peppermint tea for added focus. Who knew time management could be so pleasurable? With your focused mindset, and a clear direction of your personal values and priorities, ie, intentional living, you need an organized spot to jot down your thoughts, plans, priorities and goals to stay on track with your time management plan. An added bonus with the following planner is the motivational quotes to keep you inspired and on your way to success! I also created a workbook that offers a 21 day approach to taking control of your time. it includes a time study, reflection about your interests and values, and an opportunity to plan out goals, short term and long term. If this is of any interest to you, you can find it in my SHOP. Certainly, if aroma therapy is an area you would like to explore, researching the oils, including where they are sourced from and how they are processed is key. You want to be certain you have a quality oil versus merely a perfumed oil. You also likely want a diffuser, which is an effective way to get the benefits from the oils. I have used essential oils for over 2 decades. If you would like to learn more, I encourage you to contact me to discuss. There are many resources online to learn more, but it can be helpful to talk directly to someone for ideas of how to use them safely and effectively. Diffusers can be sourced from many places. The easiest, and likely cheapest, may be from Amazon. There are numerous styles, a variety of price ranges and like everything, different levels of quality. Spending some time learning about your options is recommended. An example of one, merely for reference, is included below. I have one in each level of my home; they are all different types. Here is an example of what they can look like, and some features they often include. Absolutely, mindfulness and living with intention for improved time management will require your desire to change; an investment in active participation and a commitment to create new habits through practice and the use of available resources to support you. The results are likely to reward you with better time management, resulting in you being in control of your time, so that you can spend your time on the priorities and engaged in pursuits most valuable and meaningful to you. In short, it is an opportunity to take control of your life! Is time management worth it? Yes! If you enjoyed reading this and found any value, I invite you to join my subscriber list; I promise to not spam you! Instead, when I have new blog updates, I can drop you an email so you don’t miss it. I can also periodically keep in touch with any news or updates, or any new additions to my SHOP that I think may offer value to you. If this interests you, add your name and email below! To Your Success! Join our mailing list to receive news, updates & promotions intended to provide value. As a gift for trusting me with your email, I will send you Your Self Development Plan. Regardless of our walk in life, self development is an area affecting each of us. To your success! Thank you, Cindy. I appreciate your comment, and I completely agree with you! Really enjoyed reading your blog as my own diffuser is on for an hour with geranium oil. So glad to hear you use mindfulness and know its value in your life! I know many who use Trello successfully; I hope you find it supports you.